Lance Cpl. 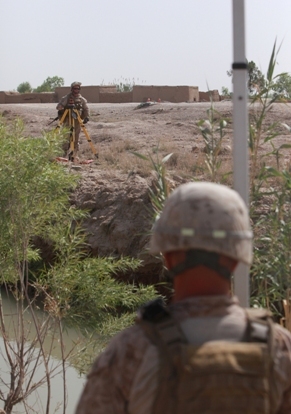 Thomas Waldburger, from Henderson, Nev., a drafter-surveyor with 8th Engineer Support Battalion, 2nd Marine Logistics Group (Forward), takes measurements prior to placing the bases of a non-standard bridge during a bridge operation in the Sistani Peninsula, Afghanistan, April 4 and 5. The Marines placed the bridge in support of 2nd Battalion, 3rd Marine Regiment, 2nd Marine Division (Fwd.) and International Security Assistance Force operations. The bridge will also benefit the Afghans by increasing their capability to transport more products and materials across the canal to local markets.